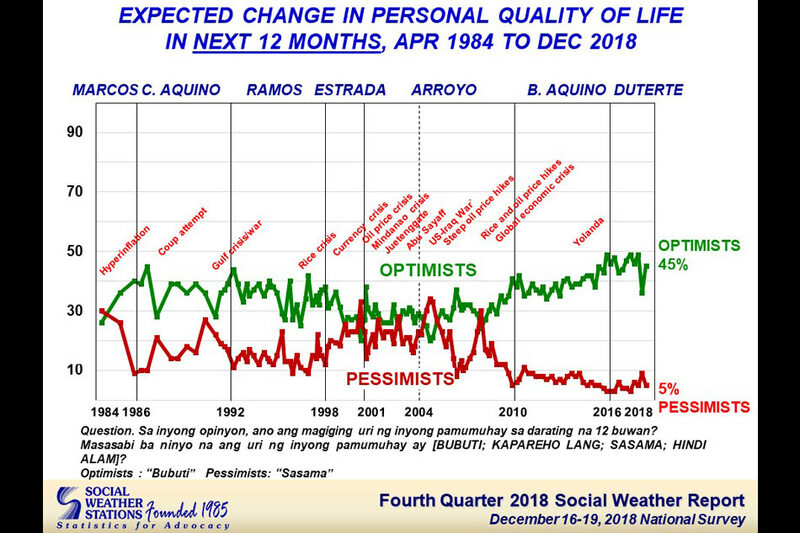 MANILA – Filipino optimism over their quality of life and their outlook on the economy has improved after dropping to a record-low in the previous quarter, a Social Weather Stations (SWS) survey revealed Thursday. 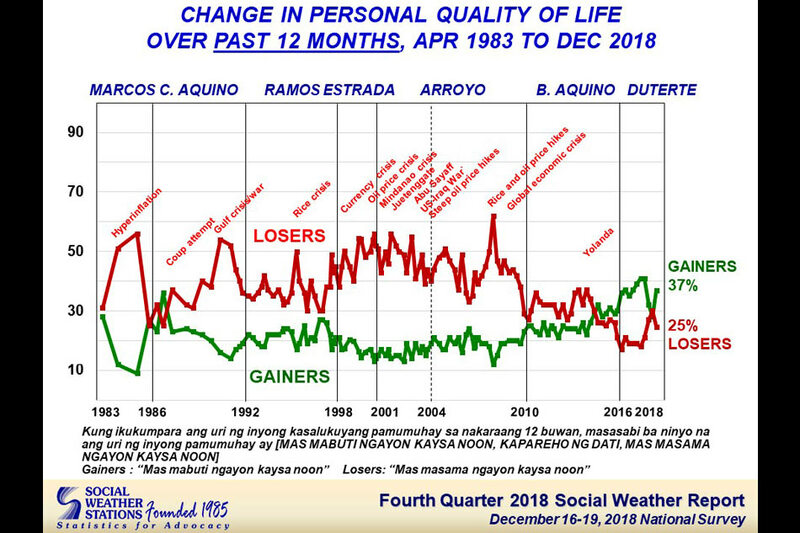 Of 1,440 Filipino adults polled in December, 45 percent said they expect their personal quality of life to improve in the next 12 months, while 5 percent expect it to worsen. This is equivalent to a net optimism score of +40 “excellent,” 13 points higher from +27 “high” in September 2018. 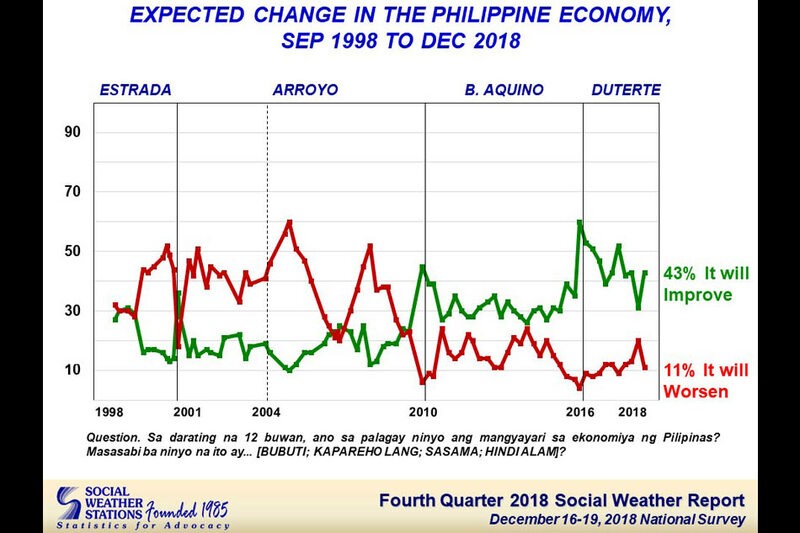 Filipinos who said they are optimistic that the Philippine economy would get better next year rose to 43 percent, while 11 percent said they feel it would deteriorate. This brings the net economic optimists score to +32 “excellent,” 21 points up from +11 “very high” in September 2018. This is a 14-point increase from -2 “fair” in September 2018. The fourth quarter poll was conducted from December 16 to 19, 2018. It has a margin of error of ±2.6 percent for national figures.